My tank was recently filled and it ran out of CO2 quickly. One drink tower is not functioning. I hear a hissing sound coming from the tank. I see frost on the tank. When an empty Bag n Box is left connected, the pump may operate continuously causing CO2 to be wasted and potentially emptying the CO2 system. Solution: Each time a bag n box is replaced, the fitting should be cleaned thoroughly in warm water to remove syrup buildup. This allows the check valve in the fitting to close when the bag n box is empty or removed. The bulk CO2 system feeds all of your carbonated drink dispensers including soft drinks, draft beer, frozen drinks and juices. Should a downstream leak occur, CO2 will be wasted and may empty the bulk system. Solution: Contact your beer or fountain drink service agent to have leak repaired. Locate the gauge at the top center of the tank. It is a typical fuel gauge style meter shaped like a small square, half moon or upside down test tube and reads Empty, 1/4, 1/2, 3/4 and Full. There are 2 other round gauges on the top of the tank. One supply gauge reads 0 – 160 or 0 – 200. The vessel pressure gauge reads 0 – 400. If the supply gauges reads 90 or less and/or the vessel pressure gauge reads 100 or less, the tank does not have enough pressure to push CO2. Please contact M&H Gas at 816-350-3355. Be prepared to supply all 3 readings to the customer service representative when you place your call. Does it appear that the noise is coming from the large brass barrel on top of the tank? Yes: You should see a tube coming off this Brass Barrel that is fed to the outside of the building. Look at the 0-400 gauge. If the gauge is reading 280psi or higher, everything is fine. The tank is designed to vent pressure and is working correctly. If the reading is below 280 psi, please call M & H Gas at 816-350-3355 for assistance. No: Try to determine where the noise is coming from. Follow the CO2 lines down to your soda and/or beer systems. If you find any type of leaks “down stream” you need to contact your beer or soda provider. 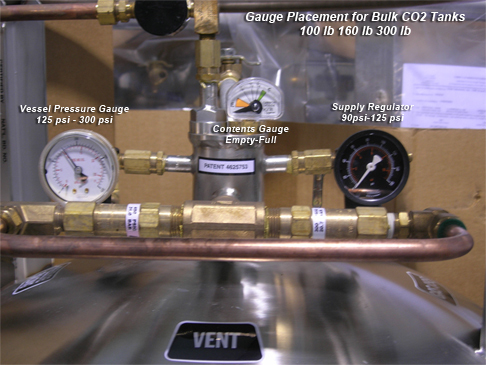 Note: If there is a significant leak “down stream” this could result in a “whistling” noise coming from the CO2 tank regulator because the leak is pushing a higher than normal amount of CO2 through the regulator. If you witness “fog” that appears to be coming off the tank or any of the tank lines, stay clear of the tank. If possible ventilate the area to reduce CO2 concentration and immediately call M & H Gas at 816-350-3355. Frost is normal during times of high CO2 demands, such as peak business periods. However, the presence of frost after opening, early in the morning or during slow periods, or an ever-present ice formation on one side of the tank near the bottom may indicate a leak in the drink system. If the ice on your tank is not melting, please contact a M & H Gas customer service representative at 816-350-3355. Frost is normal during times of high CO2 demands, such as peak business periods. However, should the frost not melt, there might be a leak in the fountain drink system. The most common causes of this are an empty “Bag N Box” connected to the drink system or a faulty pressure building regulator. Drink Temperature May Be Too Warm. Check to ensure there is an ample supply of ice in the storage bin and that the Cold Plates are not exposed (they must be covered by ice). Check to see that the carbonator is plugged into an electrical outlet. If it is plugged in, shake or bump the carbonator gently which should cause it to cycle on and off. If you do not hear it kick on, call your fountain drink service agent.